Whenever the name of Arjen Lucassen pops up in connection with a new project, metalheads worldwide take notice. 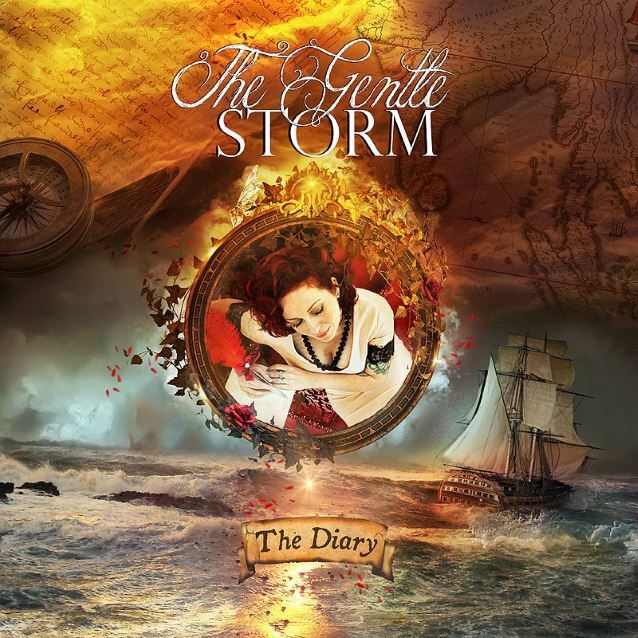 Renowned for his outstanding Ayreon project, he has dabbled in several different genres since, be it via Streams of Passion, Star One, his solo project, Ambeon etc., and when news broke that he would be teaming up with former The Gathering singer Anneke van Giersbergen for a new endeavour called The Gentle Storm, the fans listened up. Musically the direction of The Diary was announced to be a mix of classic and metal as well as acoustic folk and that there would be two versions of the album, one purely acoustic and the other one with the metal elements incorporated, but then again, who would seriously expect Lucassen to ever take the easy route? And if that was not enough already, there also is a whole concept behind the album, penned by van Giersbergen, about a sailor and his wife in the 17th century, who are apart for two years throughout his travels and only can keep in touch via letters, which are touched on in the lyrics. The acoustic first disc, aptly subtitled Gentle, might not appeal to the metalheads all that much, since it is very introspective, calm and emotional, yet at the same time the relative simplicity of the arrangements makes Anneke’s voice a particular focal point and allows her to shine, while the lack of embellishments show the sheer quality of Lucassen’s songwriting on top of it. The second disc, Storm, brings in the heaviness, bombast and progressive leanings, with some subtle changes in the arrangements between the two versions as well (as in the flute solo on “Heart of Amsterdam” turning into a guitar solo on the Storm side of the album). And The Diary probably shows Anneke at her strongest performance since her early The Gathering days, not that she delivers the same powerful performance like on Mandylion, but it is great to hear her in a more metal context again and if there is a composer that manages to highlight her voice while keeping the song around it exciting and important as well. To show some of the differences, “Endless Sea” in the gentle version is very stripped down with percussion, acoustic guitar, some violin and cello and Anneke’s voice taking center stage, while in the storm version Arjen adds a distinct symphonic and dramatic element with choir, electric guitars and everything, while Anneke still manages to shine within a beautifully dense and emotional song. Another star among great songs is “Shores of India”, which excellently conveys the exotic atmosphere of foreign shores, a beautiful and strong chorus and another great performance by Anneke, or dramatic “The Storm” that perfectly conveys the menace of the storm into the music, but in the end every track showcases the class of the duo both in terms of composition and execution. Doubling up with a calmer and heavier side is not only very ambitious, but also ultimately makes for a very interesting listening experience, that gives you a distinctly different exposure in texture and mood. At one point Arjen Lucassen will write, record and release an album that is not up to par, but so far the consistent very high level of quality he has been able to keep up for over 30 years now (starting with Vengeance) has not shown any signs of letting up, no matter which style he tackles. The Diary is a beautiful, ambitious and in the end glorious album that shows a somewhat softer, more emotional side of his songwriting and Anneke delivers her maybe best vocal performance in 20 years. What more can you ask for? This entry was posted in Featured Review, Reviews and tagged 2015, 9.5, acoustic, ambeon, Ayreon, concept album, featured, folk, insideout, netherlands, star one, streams of passion, Symphonic Metal, the gathering, vengeance.